At the Society for Immunotherapy of Cancer (SITC) 2016 Annual Meeting & Associated Programs, the society hosted a Value Summit in collaboration with the American Society of Clinical Oncology (ASCO) to continue the ongoing dialogue around the value of cancer immunotherapy. Click here to view a meeting report, published in the Journal for ImmunoTherapy of Cancer (JITC) on the Value of Cancer Immunotherapy Summit at the SITC 2016 Annual Meeting. Further, read below a brief synopsis of the program. As health care costs continue to rise, there has been intense interest in better understanding the value of current therapeutic strategies for the treatment of cancer. Historically, most oncologic drugs were evaluated for clinical benefit and potential toxicity prior to regulatory approval. Because many cancer drugs were associated with low response rates and high rates of adverse events, the high price of cancer drug development has recently been called into question. Warren Buffet is credited with saying that “price is what you pay, value is what you get”. Thus, a mandate to include an assessment of the real value of new cancer agents has become a high priority for clinicians, patients, payors and regulatory bodies in the United States and around the world. Tumor immunotherapy is a new form of cancer treatment that has emerged as a clinically beneficial alternative for many types of cancer. Tumor immunotherapy has been frequently characterized by durable responses and a very different pattern of adverse events compared to traditional cytotoxic chemotherapy or targeted therapies. To date, most value assessments in oncology have not focused on tumor immunotherapy resulting in uncertainty about the real value associated with this form of cancer treatment. This summit will discuss the issues of value with respect to tumor immunotherapy bringing a variety of different perspectives to the table, including academic physicians, patient advocates, regulatory agencies and third-party payors. In addition to articulating the unique features of tumor immunotherapy and the value proposition for this form of treatment, the summit is expected to result in a referendum on future directions and priorities for better defining the full value of tumor immunotherapy for patients with cancer. To continue learning more about this program and to access slides, visit the SITC 2016 website. 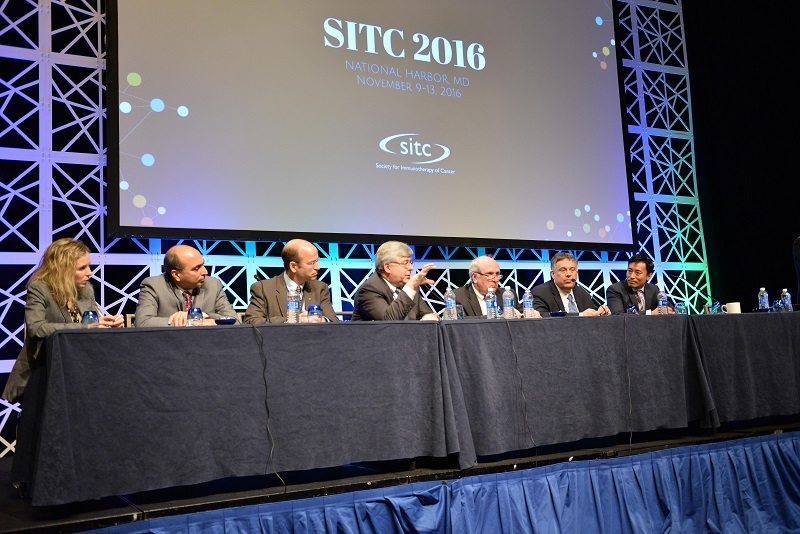 This final session of the SITC 2015 Annual Meeting brought together leaders in the field to initiate important dialogue on the value of cancer immunotherapy treatment. A variety of stakeholders, including academic physicians, industry experts, patient advocates and regulatory agencies shared their diverse perspectives about this important discussion. In addition to articulating the unique features of tumor immunotherapy and the value proposition for this form of treatment, the session resulted in a referendum on future directions and priorities for better defining the full value of tumor immunotherapy for patients with cancer. For further insight into this session, please view our press release.